The primary goal of the project is to determine prehistoric language contacts in South Asia by examining the distribution of morphosyntactic patterns in modern languages of the region from different framilies, above all in eastern central South Asia, and checking these for statistical significance with respect to potential areal and genealogical trends, constantly viewing this information against the backdrop of what is known of the history of this region and South Asia in general. To achieve this goal, the team is compiling a fine-grainded morphosyntactic database on ca. 150 languages from our core area - Jharkhand and environs - and other languages from throughout South Asia. The project is also contributing to our present knowledge of the languages of this region through conducting field work on several languages of the region on which very little is known, including Sadri, Khortha and Kormali (Indo-Aryan) and Gondi (Dravidian). Beginning of project: 1 October, 2017. Peterson, John. 2017. "Fitting the pieces together. Towards a linguistic prehistory of eastern-central South Asia (and beyond)." Journal of South Asian Languages and Linguistics, 4(2). 211-257. Peterson, John. 2017. "Jharkhand as a "linguistic area" - Language contact between Indo-Aryan and Munda in eastern-central South Asia." Raymond Hickey (ed. ), The Cambridge Handbook of Areal Linguistics. [Cambridge Handbooks in Language and Linguistics.] Cambridge: Cambridge University Press. 551-574. Peterson, John. 2010. "Language contact in Jharkhand. Linguistic convergence between Munda and Indo-Aryan in eastern central India." Himalayan Linguistics 9.2: 56-86. - Netra Paudyal & John Peterson. Participation in the "Pre-Workshop Seminar to the International Workshop on the Documentation of Endangered Languages and Cultures - With Special Reference to Jharkhand." April 11-12, 2019. In collaboration with the Dr Shyama Prasad Mukherjee University, Ranchi and the Endangered Languages Documentation Programme (ELDP), SOAS, University of London. - John Peterson. "Sadri / Nagpuri, and its Munda and Dravidian Neighbors: What can they teach us all?" Birsa Munda Language and Culture Festival, Center for Endangered Languages, Central University of Jharkhand, Brambe, India. April 4, 2019. - John Peterson. "Sadri / Nagpuri, and its Munda and Dravidian Neighbors: What can they teach us all?" Ram Lakhan Yadav Singh College, Ranchi, India. October 26, 2019. - John Peterson. "The prehistoric spread of Austro-Asiatic in South Asia." Institute for Endangered Languages, Central University of Jharkhand, Brambe, India. October 16, 2018. - John Peterson. "Why Kharia? Why Sadri? Why Jharkhand?" Gossaner College, Ranchi, India. October 15, 2018. - John Peterson. "The prehistoric spread of Austro-Asiatic in South Asia." Department of Tribal and Regional Languages, Ranchi University, Ranchi, India. October 6, 2018. Face-to-face conversation is a multimodal process, involving both spoken language as well as a variety of bodily movements, which are integrated moment-by-moment by conversational participants (or outside observers). This multimodality requires interfaces between acoustics (in particular prosodic variation), embodiment (comprising all sorts of facial and hand gestures as well as larger body movements), and structural elements of conversation. The separate binary interfaces between prosody and gesture, prosody and conversation, and gesture and conversation, have all seen progress in recent years. However, a crucial element of further progress is an investigation of the intersection between all three of these systems, which so far remains almost completely unstudied. The relationship between gesture and prosody appears to be different depending on what kind of conversational action is in question. Ferré (2014) reports gestural marking in parallel to prosody when accompanying focal accents (prominence marking), while Gorisch (2012) reports that gestural behavior is organized differently from prosodic behavior in the context of continuing or initiating turns in the environment of turn-taking. Thus it is clear that the relationship between prosody and gesture cannot be studied “in isolation”, but that it must be framed in terms of specific types of language use. Conversation, as a fundamental environment for language use, should have high priority as a target area for research. Since turn-taking organization is a fundamental element of conversational structure, it serves as a promising test domain for the investigation of this three-way interface. A pilot study carried out by some of the proposal applicants (Zellers, House & Alexanderson 2016, 2017) investigated the role that prosodic and gestural cues may play in combination with one another to help interlocutors achieve smooth turn transition in conversation. 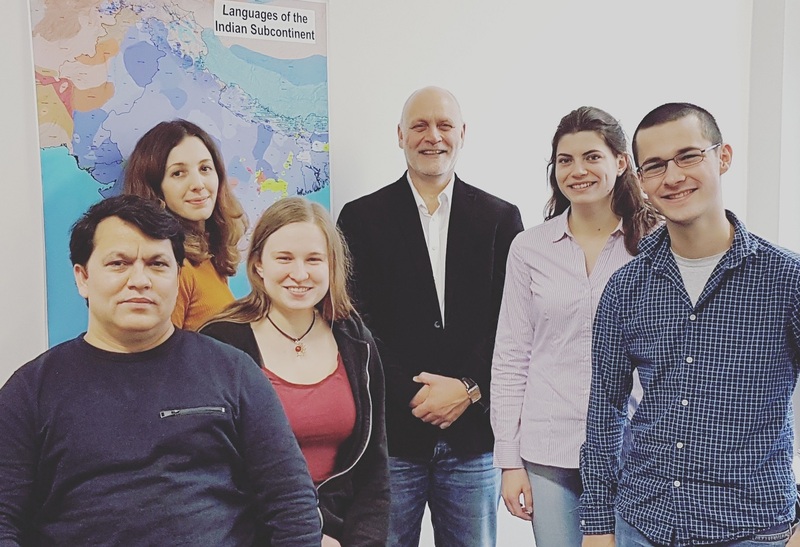 The goal of this project is to further develop that research direction, as well as to organize a workshop for researchers working at one or more of the intersections between prosody, gesture, and conversation, across disciplines such as phonetics, psycholinguistics, Conversation Analysis, and speech technology. In November, 2018, an invited workshop was held in Kiel with contributions from researchers working at any intersection between prosody, gesture, and conversation, and across a variety of disciplines. The workshop was focused on discussion, and has already led to further research developments between workshop attendees.